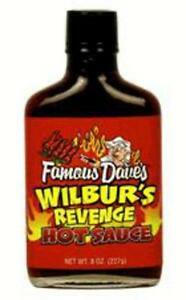 Details about Famous Dave's Wilbur's Revenge Hot Sauce - 8 oz. Famous Dave's Wilbur's Revenge Hot Sauce - 8 oz. This sauce is as close to perfect as one could get. Excellent flavors and just the right amount of heat.